A woman coming out of a building I was going into today gave me a big smile and said "Hey, I'm from Maryland too." 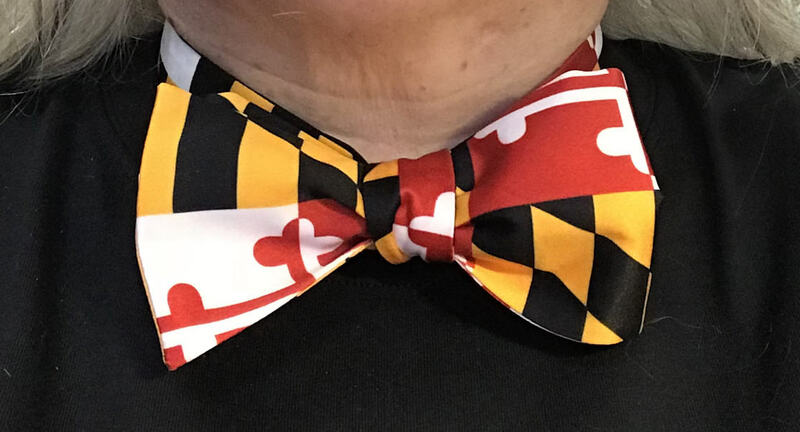 Would only a person from Maryland wear this bow tie? Maybe. Anyway I smiled back at her and said something that meant "Whoa, how about that", and that was nice. I've still lived most of my life in Maryland. But no longer half of it, as of recently. It still has almost a decade on this town, tho. I have a lot of fondness for a lot of Maryland, things about Maryland. Yet I had a hard life there, as a soul--- in various forms, some of them overlapping, in various times and various places and stages of life, sets of companions, there. A lot is now less, like, confusing; meager; fumblingly frustrated --- except "frustrated" would imply that I had hopes that were beaten down, and it was more like having limited hopes and little sense of choice, power, I-dunno. Maybe lotsa people look back and see how in the dark we were. I walked around downtown today a little, just cuz it wasn't so hot, and I'd found a parking place, and why not. Art Fair is about to descend. I'm not volunteering at the chorus's booth, tho I've been tempted to give it a go again this year. Mostly today it feels like I'm doing one foot in front of the other.